The afro is a decorative item that is wearable on the head. It does not provide any armor points to the player. The afro is crafted out of eight pieces of wool (any color). The afro can be placed in the helmet slot, or the player can shift click while holding it in their hand. It does not give the player any armor points. If fired out of a dispenser facing the player and the player is one block next to it, it will automatically equip the afro onto the player's head. There are currently no known bugs with the afro. 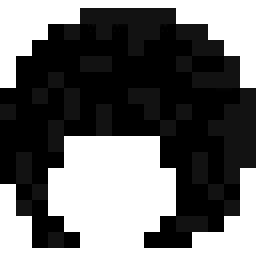 A player using the Afro. This page was last edited on 17 July 2018, at 16:11.